We are going to be doing some great barrel aged beers on tap! This month, we have the latest W00tstout from Stone Brewing, in Escondido, California. Their latest is known as the “Stone Farking Wheaton W00tstout”. 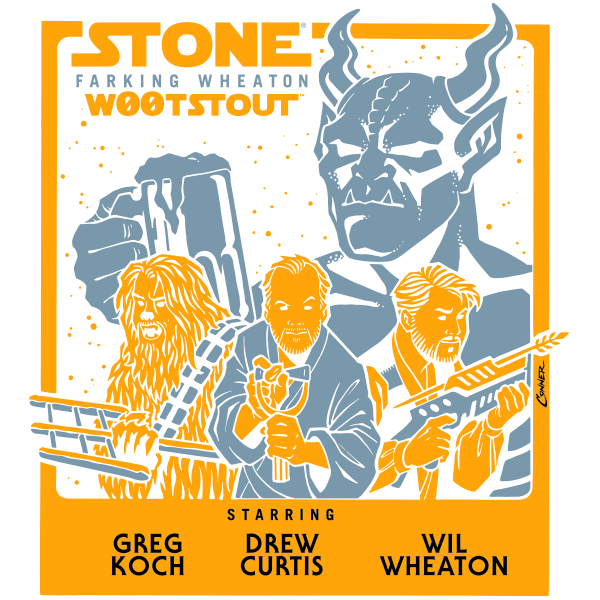 It is from the minds of Drew Curtis the creator of Fark.com, Wil Wheaton, actor and web celebrity, and Greg Koch Co-Founder of Stone Brewing. This is their 6th W00tstout. It’s a Russian Imperial stout that is brewed with pecans, wheat, and rye and ¼ of the beer is aged in bourbon barrels. It comes to us at 11.5% ABV with 45 IBU’s. This is one you don’t want to miss! Barrel aging beers in bourbon and other previously used barrels is relatively new. The first beer that was intentionally done and put out was the Goose Island Bourbon County Stout. Greg Hall the former Brewmaster at Goose Island got 6 bourbon barrels from Jim Beam and first poured his experiment at the Great American Beer Festival in Denver in 1992. His experiment launched a new genre of beer. Since then many companies have followed suit, and experimented with aging beers in not only whiskey barrels, but also wine, rum, sherry and brandy barrels to name a few. More and more breweries are experimenting with other types of ales, wheat beers, and IPA’s, being aged in many types of oaks. The best beers for aging in previously used spirit barrels have typically been high in alcohol with strong flavors such as barleywines, porters and stouts. These beers are more accepting to the flavors that come from the alcohol in the barrel and the flavors imparted by the wood itself. Check back often to see what other barrel aged beers we have on tap. We are only doing 1/6 kegs so they won’t last long! Click here to view our full beer menu!